Posted: Apr. 10, 2019	Join Now! Thinking about what to do with the kids during April Vacation? Come swim, take a class, play sports or exercise together, or let your little ones spend time with other kids in the Playroom while you enjoy a little “you” time at the Y. 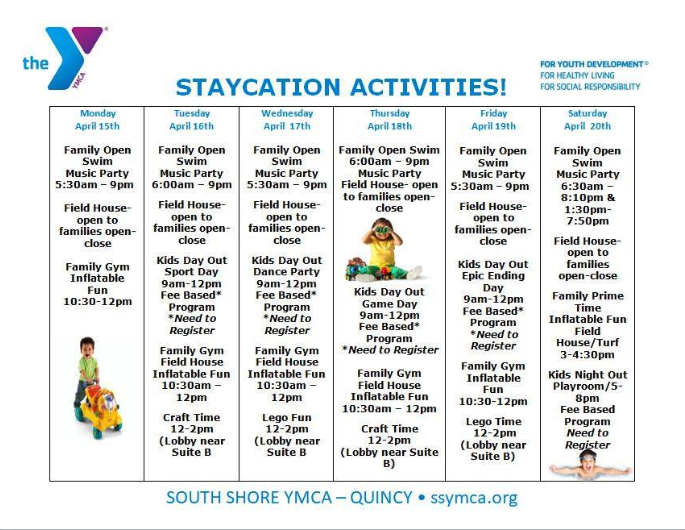 The SSYMCA has tons of activities to keep children and families busy all week long… and many are FREE for our South Shore YMCA members! Click the links below or visit our school vacation page for activities happening across the Association during April Vacation! The Emilson YMCA Branch in Hanover: See the calendar here! Questions? Contact Annie Vraibel, Director of Family Program Engagement, South Shore YMCA, Emilson Branch, at (718)829-8585 ext. 8232 or avraibel@ssymca.org. The SSYMCA South Shore Natural Science Center: See the calendar here! Laura’s Center for the Arts: See the calendar here! Germantown Neighborhood Center: See the calendar here! Quincy YMCA: See the calendar here!